of homebrewing has been to avoid regens! that's what I will use. Thanks to David Umbaugh (and his son!) 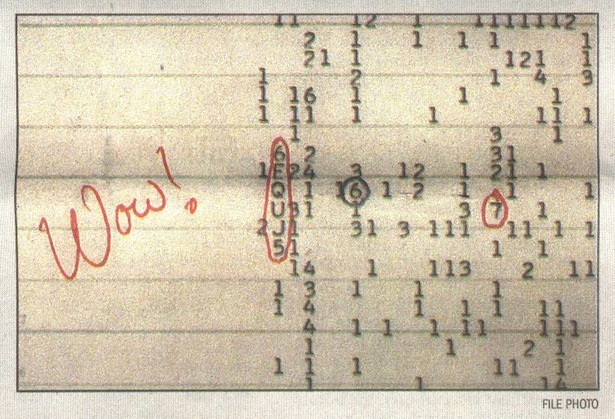 for alerting me to this really great article in The Atlantic on one intrepid amateur who has chosen to follow-up on the famous (and possibly extraterrestrial) "Wow" signal. You will like this article. Use Coupon Code VERNUM through March 31 and get 20% off. Thanks for the reports Jack! I called CQ on 20m CW for a couple of hours yesterday afternoon with no response. With the cadence of my own Morse tugging at my eyelids, I was suddenly shaken awake by a brisk signal returning my call and signing CU2BV. I snapped out a 579 report and turned it over. The dits and dahs in my headphones told me it was Fernando; operating from São Miguel island in the Azores. He reported a weak but solid copy (529) of my fifty milliwatt signal. Here's the radio that I used yesterday. The one-transistor transmitter is to the left of the red relay on the top board. The single transistor is a germanium surface-barrier device made by Philco in August of 1958. To the right of the relay is a two-transistor time-delay circuit used to switch the antenna between the transmitter and the receiver. My receiver on the lower proto-board is a reproduction of my first shortwave receiver: a $7 Japanese kit that I bought at Radio Shack when I was 13 years-old. Fifty milliwatts is some twenty-four times less power than was used by an old double D-cell flashlight. I later learned that my signal was nearly simultaneously picked up by an automated receiver located just west of Dusseldorf, Germany. Something to be considered by those hoping to win the Elser-Mathes Cup. I literally blew the dust off this thing last week. I posted the schematic a few days ago (scroll down). This morning I finished re-building the CW transmitter that went with it. I am running out of rigs to re-build, so I suppose I will now have to start building some new ones. Maybe a BITX-20? Or a BITX-75/20? Chris, KD4PBJ, of SMT Solutions, sent us a thumb drive with pictures and videos of his visit to the Southern Appalachian Radio Museum. 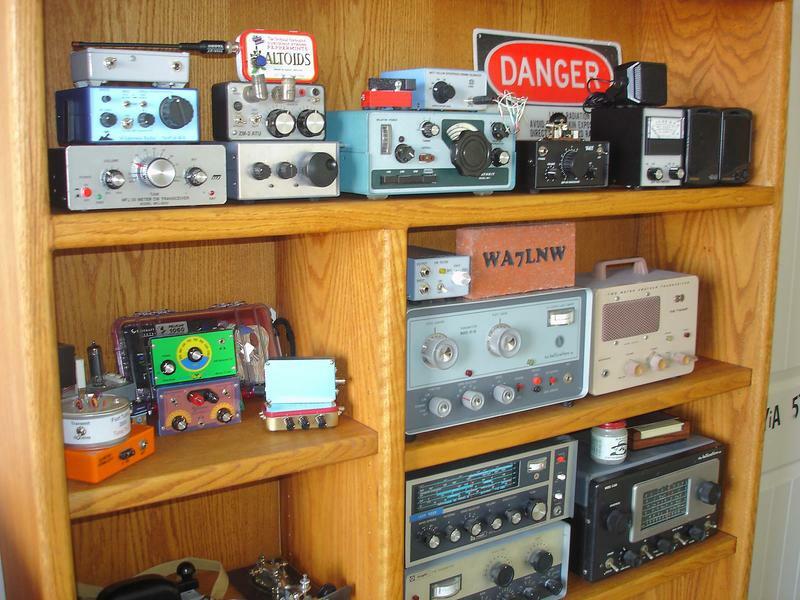 What a great collection of radios! I saw many old friends on those shelves. Thanks Chris. And thanks to the curators of this fine museum. I wish my prototypes (or final products!) looked this good. 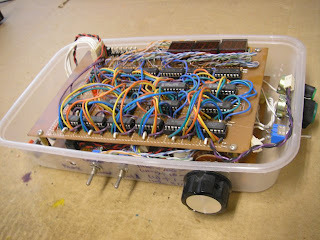 I like the way Lee puts the switches onto the prototype board. Very nice. This site shows you how to use a $35 Raspberry Pi Computer as an RF transmitter for the WSPR (Weak Signal Propagation Reporting) System. 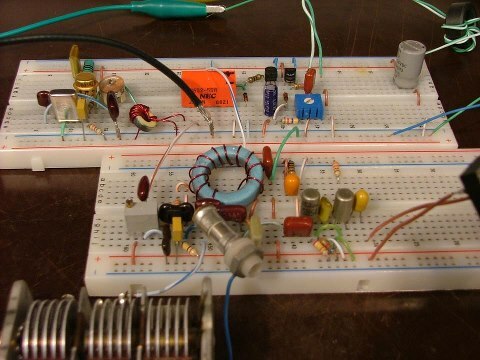 All you need is a simple low pass filter and an antenna. (Oh yea, and a ham radio license.) The site says you can get 10 milliwatts out. That's enough for WSPR! Very cool. The background hiss you mentioned in Soldersmoke 148 definitely was a crosstalk from the switching voltage converters for the CPU in your laptop. The CPUs these days are operated with voltages in the .7 V to 2 V range,with currents from several Amperes up. A high-performance CPU may dissipate150 W which can easily mean supply currents of 100 A an more. The CPU operating voltage, especially in a laptop, might change several 100 times a second. I think you can imagine the rest. Over the time you had quite some complaints about your whistling s. In former times this was definitely made worse by some technical problems. But this is a problem long gone. 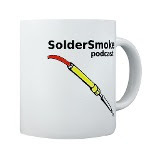 An Soldersmoke 149 I believe the remaining problem simply was the tooth gap you described a few years back. - You should record the podcast as you do now, with a 44 or 48 kHz sampling rate, that's fine. I would even record in wave format. - Then create the MP3 file with a signal rate of 48 or 64 kbit/s. Thank you Alexander. That is very useful information. I have switched to a new computer and I think the hiss problem is gone. The gap in my teeth remains however! I am thinking about getting a better microphone. Any advice on this? I am glad to hear that you are back into ham radio. 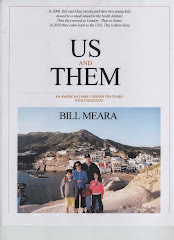 My Elmer (the guy who helped me get started as a novice) was an immigrant from Germany (Hilmar, WN2NEC). He was an excellent technician. I still use some of the things he made for me. about a microphone: Think about a headset, possibly a wireless one. I would search forums about dictation software for advice. A headset fixes the position of the microphone relative to your mouth. At the same time the microphone is near your mouth so any ambient noise is suppressed. A wireless [Bluetooth] headset would allow you to move around freely. Unless you come near a larger hard or soft surface or leave the room the sound should not change much. 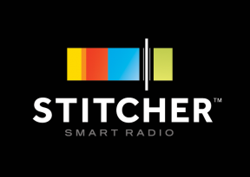 You could arrange the materials for your next podcast around the room and move from "chapter" to "chapter". And as the digitizing happens in the headset all weak analog signals are safe away from any voltage converters and digital electronics. I had never left ham radio, I just reduced and modified my activities. 2m or 70cm FM were always possible. Here in Germany we have more than 1,000 repeaters. Many of these repeaters have Echolink capabilities. For the last 15 years I have more or less exclusively worked from my car while driving. In my car I have a FT-857D. For shortwave I use monoband antennas on a PL mount at on the roof of my car. For pictures see http://www.dl4no.de/thema/amateur1.htm. The schematic in http://www.dl4no.de/thema/mobil-st.htm shows how I ensure that my TRX gets its 22 A peak from the 12V outlet in the trunk of my car: I buffer it with a 1 F capacitor - really 1,000,000 µF! The mean supply current during SSB transmit is less than 5 A. 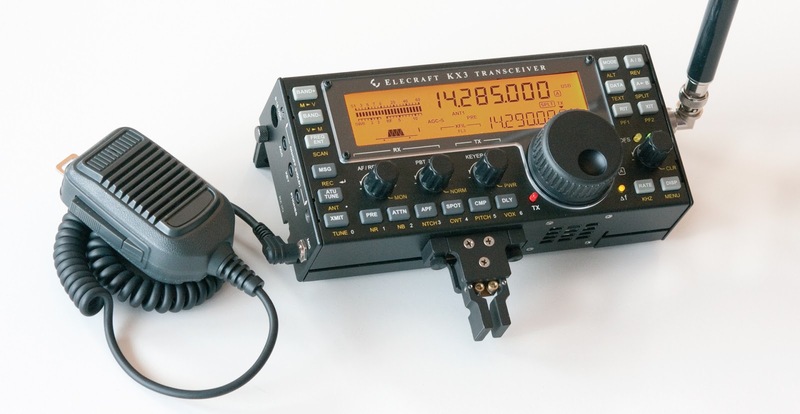 A quite important role in my ham life play the local chapters of our German ham radio society DARC. There are more than 1,000 of them, each with its own DOK. So wherever my customers are, at least one local ham meeting a month is not far away. I participate in their activities, give a lecture from time to time. This is a big help as I mostly work at my customers and these are scattered all over southern Germany. 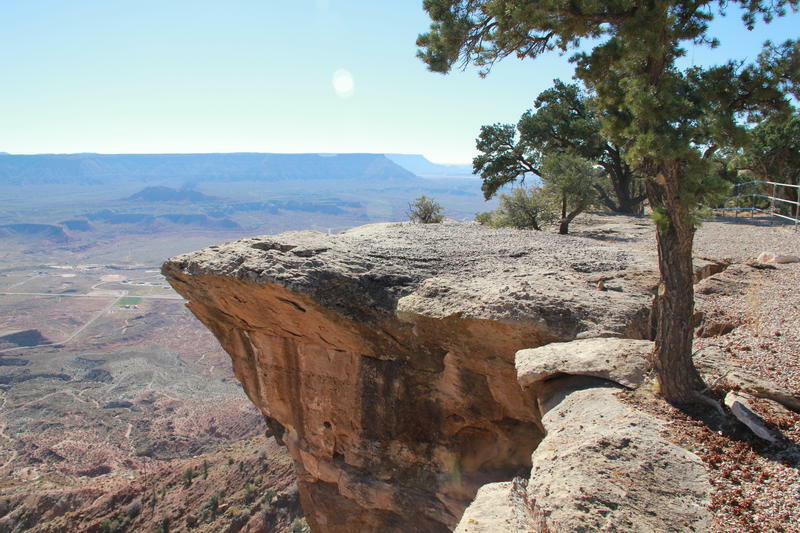 Just a short story with some local connection for you: Peter, DL5NC, spent quite a few years in the Washington, DC area. He has a US call, but please don't ask. He was born some 50 km from my home town. Formally this area, Franconia, has been part of Bavaria since 1806. Nevertheless we believe that the Bavarians have no clue how to brew beer. A recent e-mail got me thinking about Doug DeMaw's Barebones Superhet. June 1982 QST. Mostly 40673 Dual Gate MOSFETS (this one's for you Dino!). Barebones indeed. Check out the schematic. I literally blew the dust off my version and fired it up on Sunday. It sounds really great. I had lowered the values of the caps in the ladder filter to widen it out for phone. Also, I see that I used LM386 instead of the op amp AF Amp prescribed by W1FB. I notice that my version has much better audio than another version of this RX (with the op amp) that I'm using on 17 meters. Could the difference be the LM386 vs. op amp? There is a lot more audio with the 386, and the AF response seems wider. I feel the urge to put this receiver to use. I am rehabilitating the W1VD CW transmitter that used with it during the late nineties, but I'm a phone guy now, and I feel compelled to use this RX as part of an SSB rig. Of course, I could build a standalone SSB TX, but how about a diode switching scheme to make use of the Barebones' filter, the VXO and the BFO in a transceiver? A nasty Coronal Mass Ejection hit our magnetic field at around 0600 UTC today. The HF bands are now in poor shape. What better time to visit a really impressive workshop in Scotland? 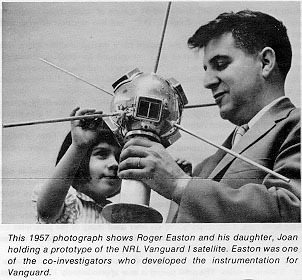 Wow, Vanguard even looks like a QRPp satellite. Kelly, WB0WQS, was trying out a new KX3 that his wife had given him as a present. The radio gods must like that low-power rig because, in what seems like a deliberate demonstration of the awesome power of QRP phone, Kelly's first QSO was with another QRP operator: me! The sun was going down and taking 17 meters with it, but neither of us missed a word. We talked about SolderSmoke and our mutual friend, Jerry, NR5A -- Kelly had known Jerry when they were teenage hams. Good luck with the new rig Kelly! Wow! "Ad-hockery... verging on being a crock." That sounds like my building technique! I thank Kevin for sending this, but I admit to now being more confused than ever. A snippet from my kluge research. This was a word I learned from my dad who told me he had heard it first used in the 1930s. Here is where I find a divergent meaning with the new word kludge which I have often heard pronounced as rhyming with sludge. I was asked why I pronounced it with the d as silent. I asked why I should pronounce a letter which was not even in the word. Thus my introduction to the new word kludge which means something very different than what I had learned from my father. 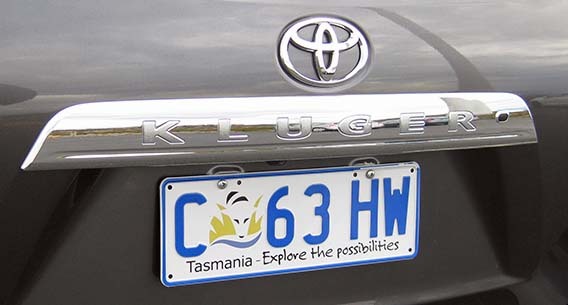 While a kluge is something clever a kludge is an ad hoc and usually buggy hack. Robinson) device, whether in hardware or software. that time, was used exclusively of *hardware* kluges. a particular nasty case in an expedient, if not clear, manner. defined "kludge" as "a crock that works". 4. (WPI) A feature that is implemented in a rude manner. oh, so clever! One traditional folk etymology of "klugen"
well have been the man behind this myth. building was demolished in 1999). implemented in a rude manner. 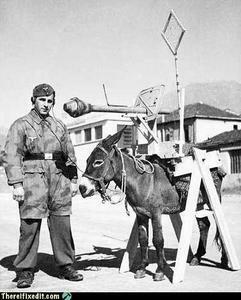 this story also aver that `Kluge' was the name of a design engineer. feeder was the most likely source of the folklore. also located) during the war. article mentioned above; it was titled "How to Design a Kludge"
centrifuge, and deluge as opposed to sludge, judge, budge, and fudge. Almost forgot! Happy Pi Day! And happy birthday Albert Einstein! Every once in a while, it's a good idea to step back and consider the big picture. Fabio, IK0IXI, is an electronic wizard from Civitavecchia, near Rome. Check out his very nice DC receiver. Note that wonderful direct conversion sound. Very cool that has it atop our beloved SPRAT. Below you can hear the effectiveness of the audio filter. Bravo Fabio! 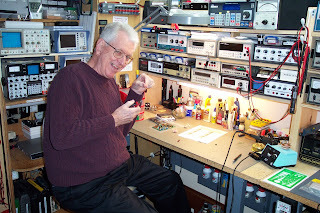 Bill - Enjoyed your conversation regarding seeing the Maker guys at a recent hamfest. Thought I'd let you know that, at least on a small scale, we've created a ham hacker space in our club by organizing a "Builders Group" as an adjunct to the Williamsburg Amateur Radio Club (WAARC) here in Williamsburg, VA. 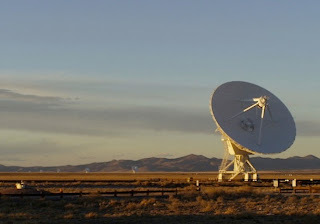 I volunteered my QTH as a meeting place and the majority of projects have been either QRP or test equipment related. Folks select their own project and bring their own tools to use. These projects have included the Hendricks tri-band QRP transceiver, NorCal FCC-1 frequency counter, N3ZI digital dial, Tuna Tin II transmitter and others. I corralled two friends in the club to act as "mentors" to assist less experienced builders with soldering and construction. Once builders complete their projects my workbench upstairs is available to verify correct operation or troubleshooting as required. 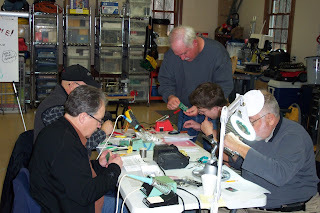 Here are a couple of pix of the guys having fun melting solder. Thank you for taking a few minutes to read my email. 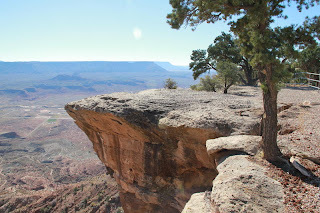 I recently found your blog and enjoyed reading the entries. However, the most interesting and exciting article I discovered was your "Homebrew Radios in the Age of the Internet." The article reminded me of a project started 30 years ago this month and placed in a box in the attic to wait until I could return to it. Thirty years of health care management work filled the interim. The project is the 8P6 Hamcation rig by W1FB from QST of June and November 1982! I searched through the cob webs in the attic and found that all the boards are completed and I even fabricated a case. The original QST's were there too! In response to a (somewhat strong) suggestion from my wife to "get a winter project going", the rig is back on my retirement work bench. Wahoo. Progress to date has been instructive and fun. The boards are all cleaned, checked, and 95% wired together in the case and working. I attached 2 photo for your pleasure because you wrote specifically about the receiver in some blog posts. This is where I am scratching my head. As you say in the article, "receivers are tough". I am confused and a bit frustrated about the correct procedure and sequence to correctly align the Barebones superhet. I can already hear stations and the noise level is acceptable. But I am not quite sure how to proceed in peaking up the receiver (hit a plateau?) Any suggestions for a newly retired ham now with the time to get back to the bench? Thank you very much for your kind comments and interest in my project. 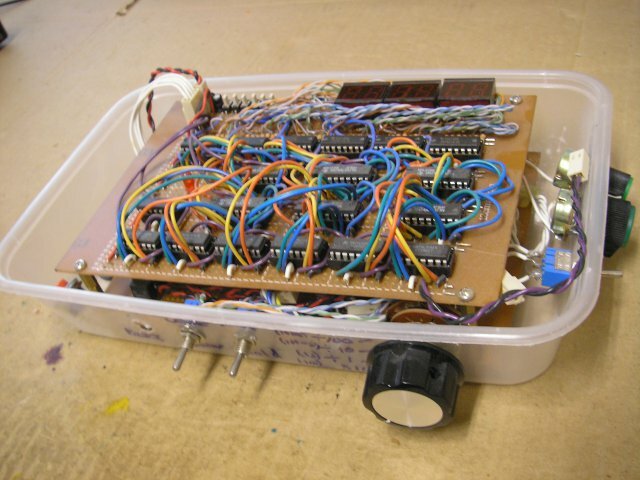 Wow, what a cool resurrection project! I recognize both the receiver and transmitter boards. The RX is clearly DeMaw's Barebones Superhet on a FAR Circuit board. I am listening to one of those AS I TYPE. Mine was put together by Dale, W4OP, and currently inhales on 17 meters. The TX board is what became known as the VXO 6 Watter. 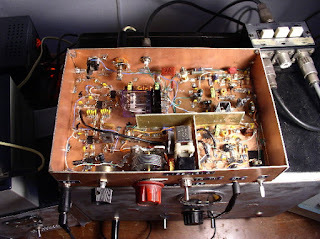 It was (I think) designed by W1VD, and appears in the ARRL book "QRP Classics." This was my first really successful homebrew rig -- I built that transmitter in the Dominican Republic in 1993. I still have most of the board, and the 20 meter Barebones RX that I used with it. Richard's message makes me want to put this old gear back on the air. I hope Richard will send us an update on his Barbados revival project. 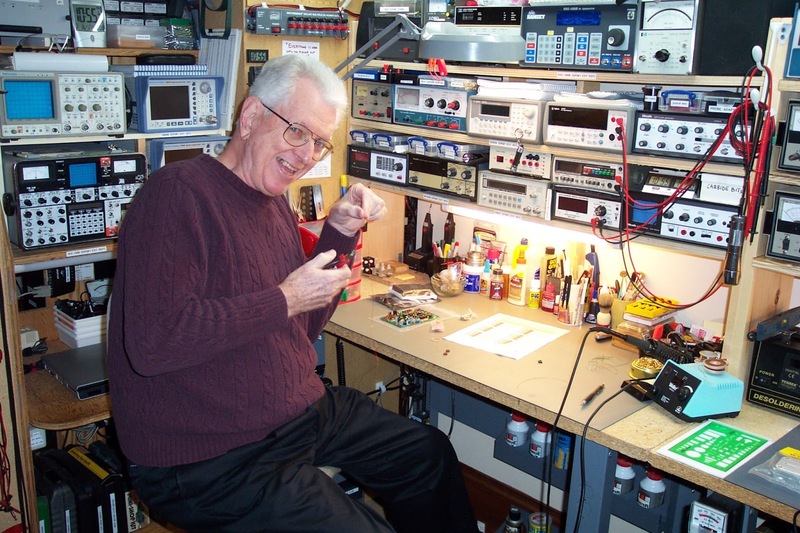 I'm sure Doug DeMaw would be very pleased to know that his projects are still providing radio amateurs with a lot of fun and inspiration. -- N2CQR WINS ARRL INTERNATIONAL DX DSB CONTEST!!!! Let’s discuss squashing low frequency oscillations in a QRP transmitter; say at 200 KHz or so. A low value resistor across the coil (12t -- FT37-43) often works well to stop these. Oscillations come from the transistor: gain versus frequency isn’t linear, nor is impedance at transistor ports. 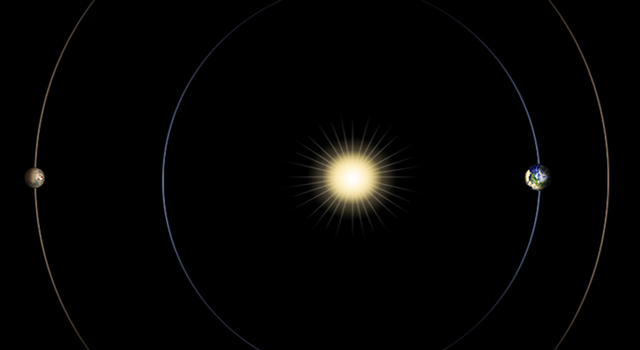 We’ll often add negative feedback and such to stabilize an amplifier towards unconditional status. In my Tx circuit that oscillated, no feedback was applied. In the case of an inductor wound on a FT37-43 or FT50-43, the Q is already low (say 8- 15 or so). Obviously a resistor in parallel with such a coil is not going to lower Q since Q is already quite low. That R will reduce the inductor impedance and thus may serve to decrease the low frequency gain of the RF amplifier to stop any low frequency oscillations. This might not work so well with a way-high fT transistor where decoupling might be hampered if UHF oscillations are singing. Doug DeMaw often referred to the parallel resistor as a Q-killer. If we examine the equations describing parallel, or series resonant circuits -- if the Q of a tank is high enough, we can practically ignore the effect of resistance at resonance. Conversely if we add a resistance and make it high enough, we might even obliterate the resonant frequency or “kill the Q”. Engineers have long placed an R into a parallel-tuned circuit to drop Q and stop oscillations — they refer to it as damping. 1 example might be in old TV sets where a variable resistance was added to peaking coils to prevent a tank from ringing at a frequency determined by the coil L and distributed C. This applies to higher Q inductors and not our FT37-43 inductor. Our teacher, Wes, teaches us in EMRFD that coupling often occurs along the DC power supply lines. Further, he’s taught us to decouple AC by placing high impedance in this path. Often the impedance is a low-pass filter with series element(s) of a high Z and shunt element(s) with a low Z. The filter must present a simple short circuit (or perhaps just a resistance) at low frequency so DC flows to the amplifier. Oscillations should likely be identified and treated according their frequency. This topic looks advanced and all RLC networks deserve more attention from us. While not really homebrew, they do deal with QRP and RF. The first two are walk-throughs of the schematics of two QRP transceivers, and the last is a discussion of how diodes can be used as RF switches. I thought you'd find them interesting. I've been enjoying your podcasts for a couple of years now and have read both of your books. Please keep up the good work it is much appreciated. In fact, as I can now have both your books and your podcasts on my iPod they are quite literally held close to my heart. Inspired by your "Kludge Controversy" - enclosed are a couple of photos that I took while on Mount Wellington in Tasmania. Mount Wellington is a high mountain and is a good launch point for radio waves over the city of Hobart. 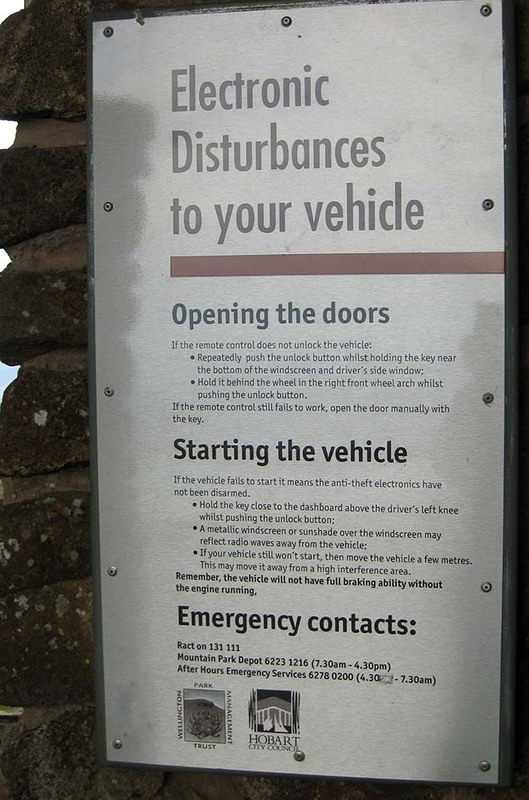 The visitor lookout has this fantastic warning sign "Electronic disturbances to your vehicle" warning that the transmitter on the mountain can seriously interfere with your car and it may not start, the doors may not open, and the immobiliser may permanently immobilise it. 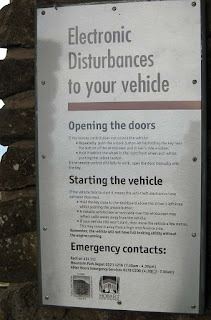 The advice is "A metallic sunshade may reflect radio waves away from the vehicle" and allow you to start it. I'm sure your QRP rigs need no such dire warnings! And in the very same car park I see this car called a Kluger. In what flavour of English is that a good idea? I know the Brits and Yanks differ over a few phrases but I've never before come across an Oz word that means the exact opposite. Thanks again for all your many inspiring "broadcasts", and may the Magic Smoke (http://en.wikipedia.org/wiki/Magic_smoke) always stay where it should!